Think you’re paying too much for your property tax where you live? Check these numbers to see if you really are. Think you're paying too much for your property tax where you live? Check these numbers to see if you really are. The housing market across the country has tanked. That should mean lower property taxes, right? It’s true that property taxes do fall when housing values drop. But this fall doesn’t happen in perfect time with the market. There’s usually a delay. And even when property taxes do fall, it’s often not enough to satisfy cash-strapped homeowners. This isn’t surprising. Homeowners today are struggling with plummeting home values. Those who bought their homes in 2004, 2005 or early 2006, especially, have most likely seen their homes lose tens of thousands of dollars in value. It’s little wonder, then, that homeowners today are taking a closer look at their property taxes. Here is a look at what type of property taxes you pay depending on the state that you call home. If you live in New Jersey, you might not want to open that property tax bill. The state featured the highest median property taxes on owner-occupied housing, according to 2008 data by the U.S. Census Bureau. Homeowners here paid a median of $6,320 in property taxes each year. Connecticut came in second with a median property tax of $4,603 on its households. Right behind was New Hampshire, $4,501; and New York, $3,622. Other states with high median property taxes include Rhode Island, $3,534; Massachusetts, $3,404; and Vermont, $3,281. Looks like you shouldn’t buy a home in the East if you want to pay lower property taxes. On the other end of the scale, Louisiana homeowners paid a median of $188 on their property taxes. In Arkansas, that number rose a bit to $383, while it stood at a still low $457 in West Virginia. In Mississippi, this median value stood at $468. Other states with low median property tax figures were South Carolina, $678; Oklahoma, $762; and New Mexico, $843. In general, these median property tax numbers do make sense. The states that have the highest median property taxes tend to have the highest median housing values, too. The opposite holds true, too. For instance, the states with the lowest median housing values include West Virginia, $95,900; Mississippi, $99,700; Arkansas, $105,700; Oklahoma, $105,500; North Dakota, $112,500; and Alabama, $121,500. These states also tend to have some of the lowest property taxes. Some of the states with the highest median home values include Hawaii, with a median value of $560,000; California, $467,000; New Jersey, $364,100; Massachusetts, $353,600; and Maryland, $341,200. Again, the property taxes tend to align well with these prices. Homeowners in these states pay some of the higher median property taxes in the country. The most important number, though, when analyzing property taxes isn’t what homeowners pay in each state. It’s how high this figure is in relation to home values. For instance, Texans don’t pay the highest median property taxes in the country. They do, though, pay the highest percentage of their home values in property taxes, 1.76 percent. 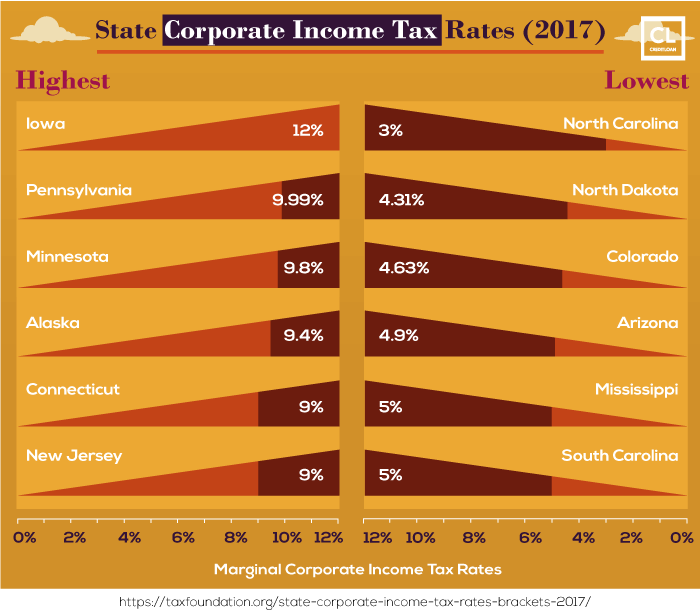 Other states fare poorly in this measure, too: New Jersey, 1.74 percent; Nebraska, 1.72 percent; Wisconsin, 1.71 percent; and New Hampshire, 1.70 percent. 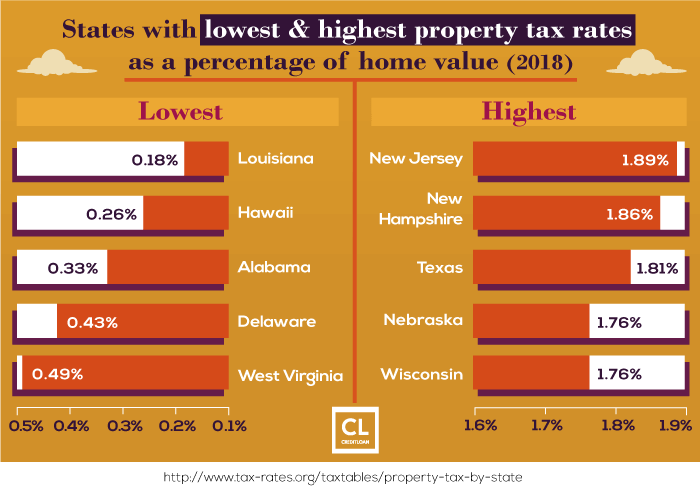 If you want to live somewhere where property taxes take up the lowest percentages of your home’s value, you might want to consider moving to the South. For instance, homeowners in Louisiana pay 0.14 percent of their home values in property taxes, lowest in the nation. Hawaii comes in second with a figure of 0.24 percent. In Arkansas, that number is a still low 0.32 percent, while it’s at 0.47 percent in Mississippi. In West Virginia, the percentage rises to a still low 0.47 percent. Analyzing the impact of property taxes is far from an exact science. But by looking at how large of a percentage these taxes take up when compared to housing values, homeowners will get a better idea of what kind of financial burden property taxes are placing on them. Tax laws vary from state to state, which means that the tax rate in Massachusetts may be very different from the tax rate in Mississippi. 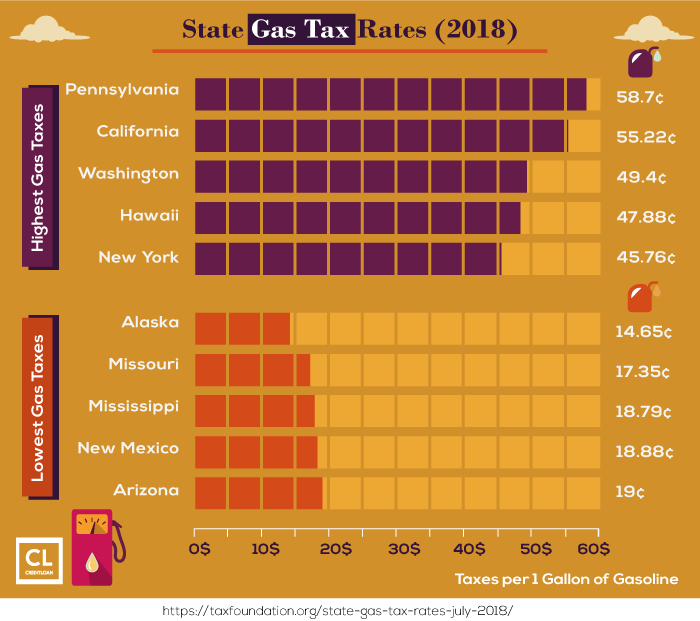 As April 15th draws nearer, you may wonder just which states in the union offer the best tax rates, and the least. In fact, if the taxes in your area are bad enough, you might just consider moving! 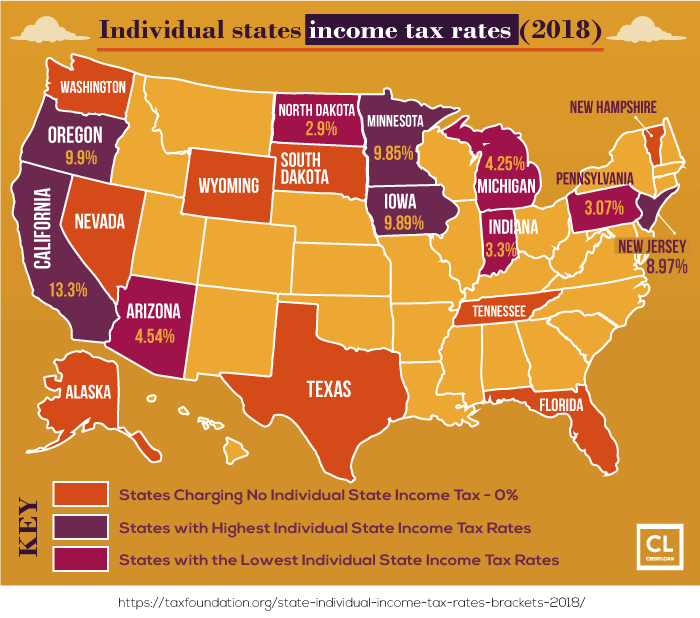 Among the 50 states, a handful don't charge income tax or sales tax. Texas, Nevada, Florida, Washington State, Tennessee, and Wyoming don't have state income taxes. 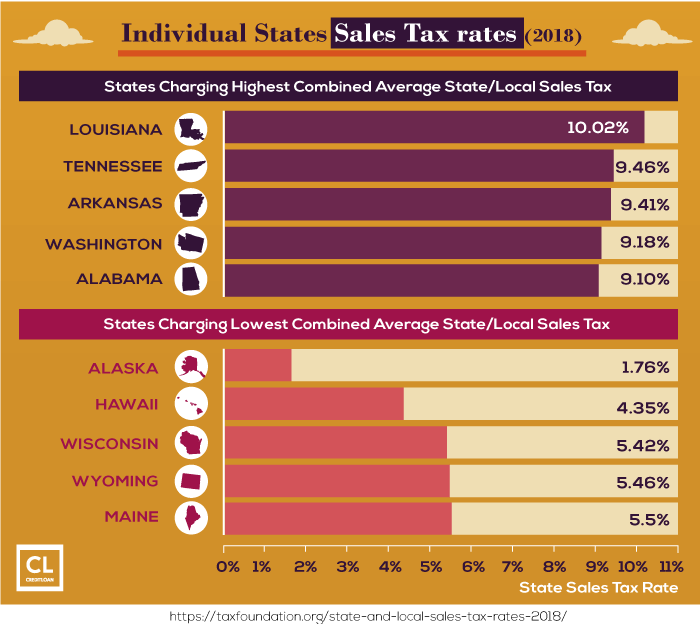 Oregon, Montana, and Delaware have no sales tax. New Hampshire and Alaska have neither kinds of sales tax; in fact, Alaskan residents also receive an oil dividend of $1654 per year. Since purchasing a home is probably the single largest investment most families will make, it helps to check out the property taxes state by state. Following is a list of the most affordable states for property tax, ranked by the median property taxes paid per state, the percentage of taxes paid against the average value of homes, and the percent that tax is of the median income of that state. Doing Business on the Cheap: Which States Rule? Because of the absence of income tax and sales tax in some states, they are more conducive to business than others. The top five states in the union for setting up a business are: South Dakota, Alaska, Wyoming, Nevada, and Florida. But the five states that put the thumbscrews on businesses and really levy a great deal of taxes are New York, California, New Jersey, Connecticut, and Ohio. Sin Taxes: Who Charges the Most for Fun? 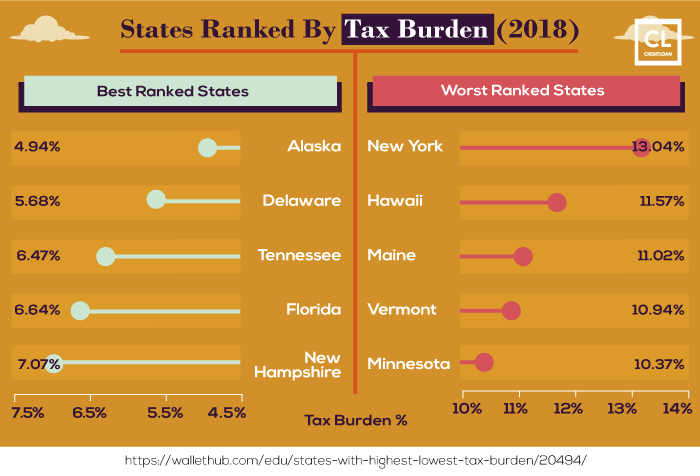 When it comes to “sin” taxes, some states definitely charge more than others. 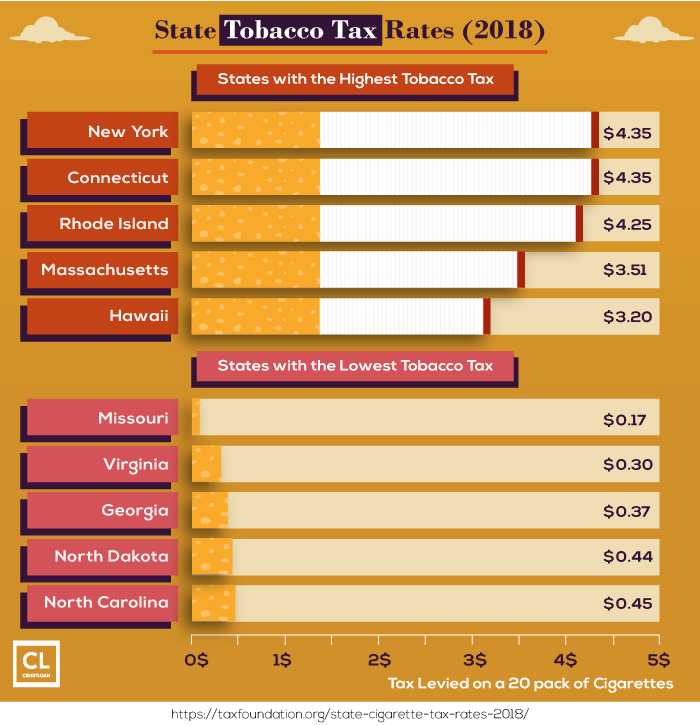 New York leads the way for heaviest cigarette taxes, while Missouri is the lightest. 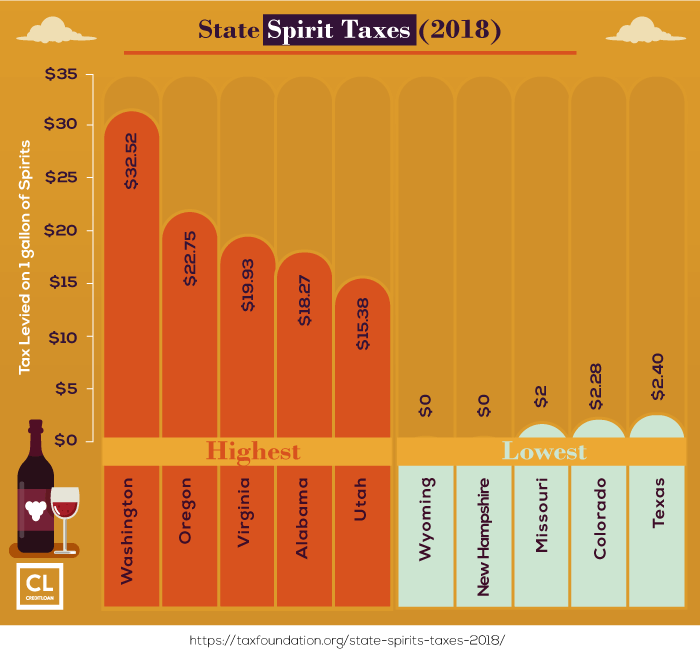 Alaska charges the heaviest taxes for liquor, but Wyoming charges the least. If you win the lottery, Rhode Island only charges 22% on lottery winnings, while West Virginia charges 61%.